Here are 10 tips for you to review before you go out on your next winter camping trip. 1) This is number 1 on your list. To paraphrase one of my favorite “action heroes” and all around “good guy”, Clint Eastwood once said, ” a man has gotta know his limitations “. This expression applies in winter camping more so than in all other winter activities that you will participate in as a novice. To spend the night, sleeping on the snow, in freezing temperatures, requires the toughness of an action hero. Lucky for you that if you are not that tough, you can simply make up the difference with preparation. 2) Where will you spend your first night sleeping on the snow? This important factor refers immediately to preparation. By researching the area, you can quickly find out what type of climactic conditions you will be dealing with. If temperatures are in the 0°C range, cold weather preparation and skills required are not the same as if expected temperatures are in the -30°C range. 3) What temperature range are you expecting and add 5 to 10 additional degrees to increase your margin of safety? If this is your first winter camping experience, I suggest that you seriously research the “expected” temperatures for the area you will be camping in. Included in this exercise are last week’s weather forecast and the weather forecast for the coming week. 4) If this is your first experience winter camping, you should not be trying this alone? Common sense is not that common, so unless you are a seasoned veteran do not try this alone, on your first occasion. Many men and women have spent countless nights alone in the frozen wilderness, however, these people have either continued from Spring, Summer, and Fall camping or are probably veterans from previous winter seasons. 5) Now that you’ve convinced yourself, let’s see what you have in your backpack? Food, Clothing, Shelter, and Equipment. Doesn’t get any simpler, but be aware of how these apply to your winter situation. This is not a complete list of all the items that you need for camping, but rather a list of the ones that need to be more winter friendly. An extra set of a base layer and mid layer clothing in a waterproof bag. A 4-season tent. A Sleeping bag and sleeping pad. A stove, preferably the white gas variety. A Cookset and assorted utensils. All of these must be rated for winter temperatures you expect after researching the weather history of your chosen area. 6) Let’s talk about your clothing. You have undoubtedly heard this before. You must dress in layers. Now let’s look at this very closely. There are 3 layers that you must wear in cold environments. The first layer is the base layer. This is the layer that contacts your skin. This layer wicks the moisture from your skin into the mid-layer. The mid-layer is the insulation layer. The outer layer is the layer that protects you from the rain, the snow, and the wind. This is called the outer shell. Do not bring cotton. Cotton dries very slowly and will result in shivers and hypothermia. Synthetic materials for the base layer, wools, and fleeces for the mid layer. Winter hats, tuques, balaclavas, gloves and mittens are all necessary. Waterproof insulated boots, extra socks in your waterproof bag, and gaiters complete the set. Cross-country skis and snowshoes can also be included here. 7) Let’s plan your shelter. Will you be sleeping in a heated or a non-heated tent? Again, here you will need a 4-season tent. These tents are more robust and more capable of withstanding higher winds and heavier snow loads. 8) Let’s look at your sleeping system. Basically, your sleeping system consists of a sleeping pad or mattress and a sleeping bag. If you do not know the expected temperatures it becomes harder to feel confident that you will get a good night’s sleep. In the summer months, a bad night’s sleep is just that. In winter, a bad night’s sleep is much more uncomfortable and could also be deadly. Now, I do not want to discourage you from winter camping, I simply want you to be prepared for this wonderful experience. If you are not ” warm and toasty ” all night, chances are that you may not enjoy the experience, and you will not want to do this again. 9) Let’s talk about hydration. Your body needs to be hydrated at all times. This especially true in winter when activities such as snowshoeing, cross-country skiing, and simple walking burn large amounts of calories and cause the body to sweat profusely. 10) Let’s talk about food. Food is your fuel. It can also be part of this exhilarating experience. You will be burning lots of calories so bring lots of your favorite snacks. Eat in small amounts and eat often. Here is another area where a superior quality white gas stove will come in useful. Dried meals in a pouch are quick to prepare by simply adding boiling water. Hot Chocolate during the day with your snacks and of course Coffee in the morning, to get your day off to a good start. 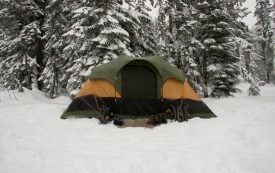 If you are planning a winter camping trip, it’s most likely that you have been camping in the 3-seasons. Winter Camping, if you can manage to stay warm, will be one of your most rewarding adventures. Have you been winter camping before and if so how did you enjoy this experience? If you have any comments, questions, or suggestions about winter camping, please do not hesitate to express them in the comments section below.